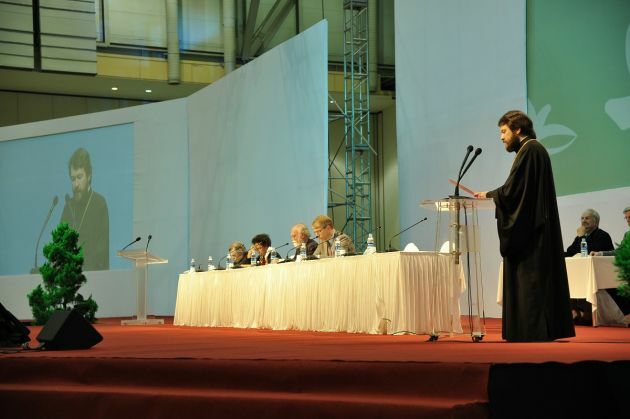 (Photo: Russian Patriarchate)Russian Orthodox Metropolitan Hilarion of Volokolamsk addresses the Assembly of the World Council of Churches in Busan, South Korea on November 1, 2013. BUSAN, South Korea – A senior Russian Orthodox Church official has called into question the effectiveness of the World Council of Churches as an instrument for Christian unity. "The World Council of Churches today remains a unique instrument of inter-Christian cooperation that has no analogy in the world," said Metropolitan Hilarion of Volokolamsk at the 10th Assembly of the World Council of Churches in Busan on Friday. "However, the question arises as to how effective this instrument is," said Metropolitan Hilarion of Volokolamsk, who heads the external church relation section of the Moscow Patriarchate. The Russian cleric, who is a past member of the main governing body of the World Council of Churches, its central committee said that one of the problems the WCC encounters today is its finances. The WCC, representing some 560 million Christians all over the world and its highest governing body, its assembly meets about once every seven years when its business and direction is discussed. Hilarion said that some ascribed the WCC's fiances to the global economic crisis. "I cannot agree with this opinion. The experience of other international organizations, whose work is of general benefit and therefore needed, has shown that funding can often be found for noble goals," said the metropolitan who received part of his education at Oxford University. "This means that the problem is not the economic crisis, but how relevant and important is the work of the WCC for today's international community, which is made up to a significant degree by, and at times, a majority of Christians," said the 47-year-old metropolitan. Hilarion said the WCC was created in response to challenges of the post-World War II period. "The contemporary situation demands from us more decisive action, greater cohesion and more dynamism." Hilarion said that two fundamental challenges face the the Christian world today. "The first is that of the militant secularism which is gathering strength in the so called developed countries, primarily in Europe and America. "The second is that of radical Islamism that poses a threat to the very existence of Christianity in a number of regions of the world, mainly in the Middle East, but also in some parts of Asia and Africa." Hilarion said, "It also demands a re-orientation of the basic direction of our work, a change in priorities in our discussions and deeds. "While we continue to discuss our differences in the comfortable atmosphere of conferences and theological dialogues, the question resounds ever more resolutely: will Christian civilization survive at all?" The Russian Patriarchate is the biggest Orthodox church in the WCC, but it does not always agree with other member churches. Hunter Farrell, director for World Mission in the Presbyterian Church, USA told Ecumenical News that he wonders from where the new energy of the WCC and the ecumenical movement might come. The PCUSA's Farrell also wonders that if the movement does not reinvigorate itself if it can maintain a place in the world. "[For the WCC] to show concrete actions of solidarity will show younger generations that this is the boat we want to get on. If the church or the ecumenical movement is not about that, it will sink," suggested Farrell.